Although we're in Portland now, Parklife Press spent most of its first decade in Chapel Hill, less than a mile from UNC. On the far side of campus, beyond the sea of pastel polo shirts and khaki shorts, was PlayMakers Repertory Company. This year PlayMakers is celebrating its 40th year, and unlike the previously mentioned campus fashion choices, I hope it never goes out of style. 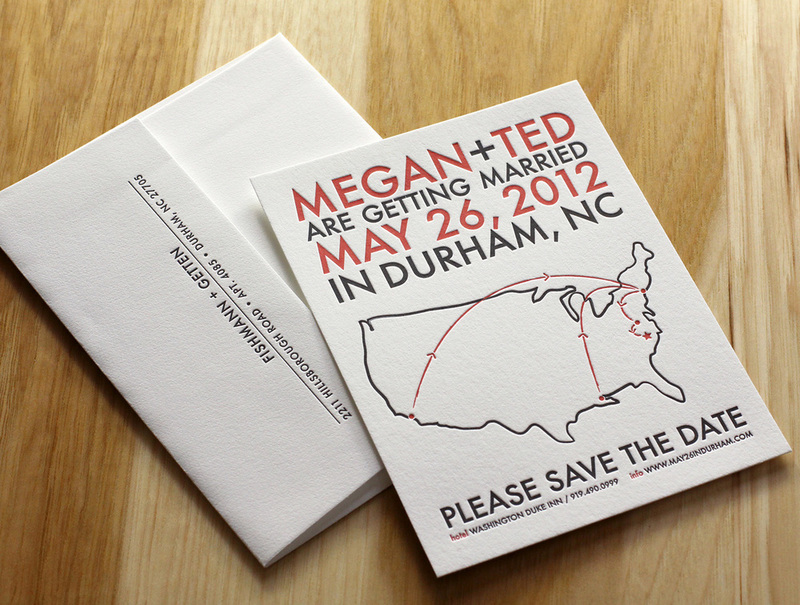 Posted in event invitations and tagged with save the date, tea-length, black, scarlet, red, pearl white, logo, 300g, envelope flap. November 22, 2016 by Travis Friedrich. 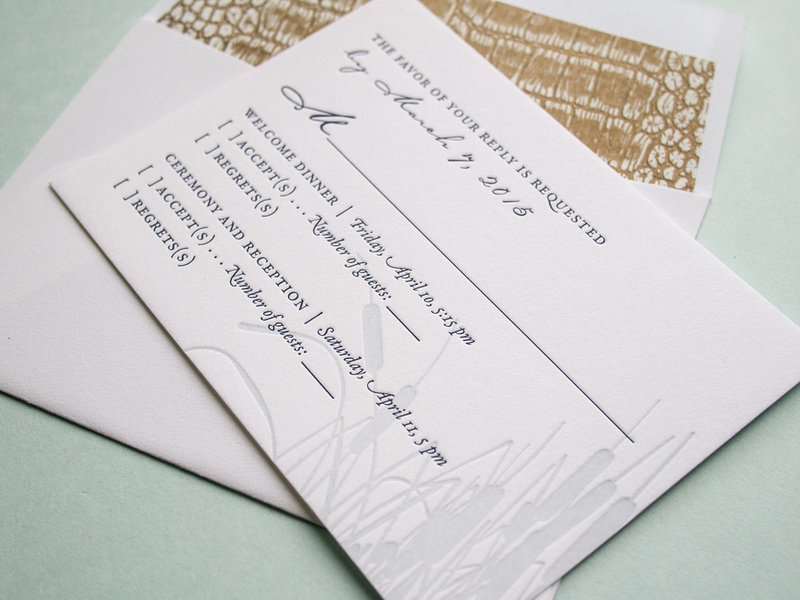 It's great when we get to work with a wedding client from the very beginning – starting with the save the dates, moving on to the invitations, and then following through to the wedding day pieces. We did this for Elisa and Alexander, shifting the design vision slightly throughout the process while still maintaining a cohesive aesthetic. 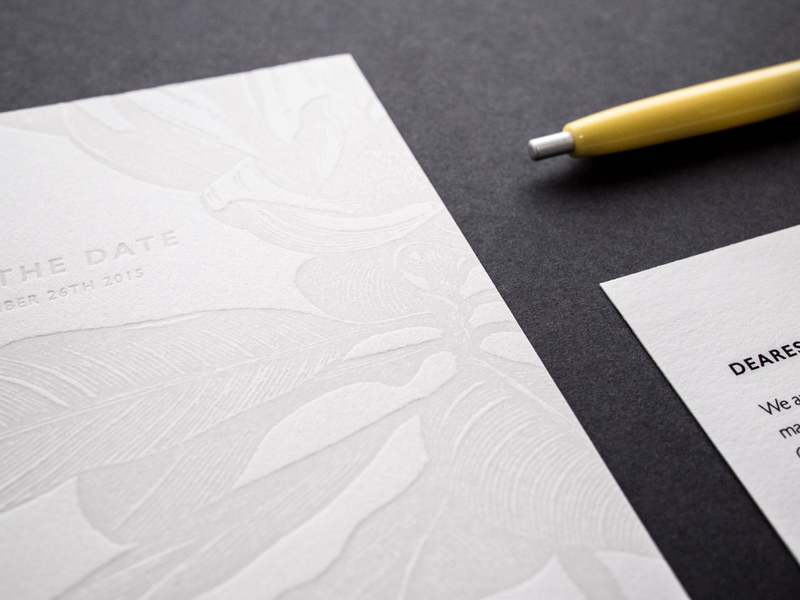 For the save the date, we printed tinted white and Espresso inks on an oversized 600g Pearl White card, tucking the text in the corner and emphasizing the dandelion motif. 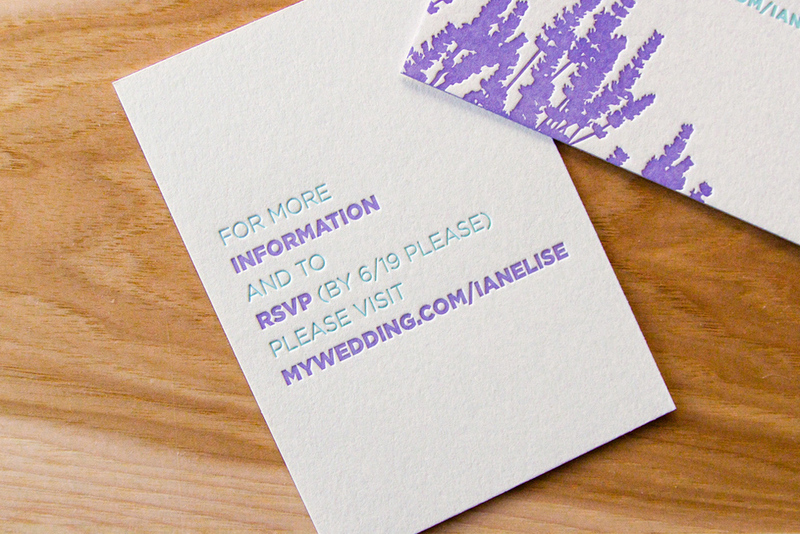 Moving to the invitation set, we got a bit more elaborate and less minimalistic. 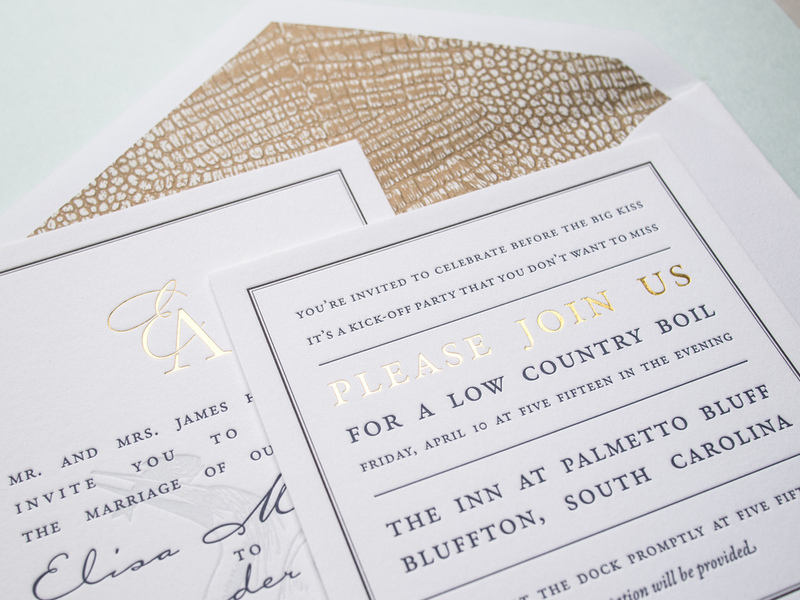 The alligator-print-lined envelopes housed a gatefold card, guarded by a pair of blind-pressed gators. 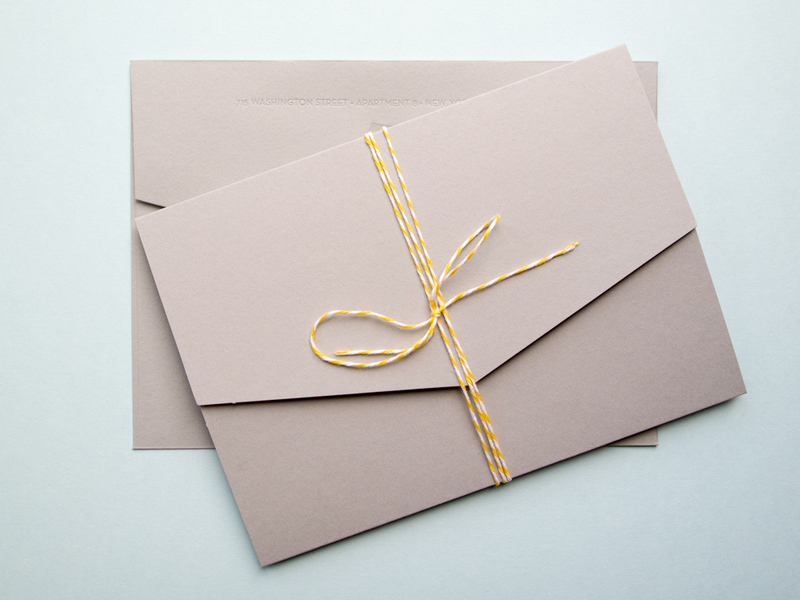 Inside was a 3-ink + gold foil invitation on thick Fluorescent White paper, a 2-ink + foil pre-party card, and a 2-ink reply card with a lined reply envelope. We unfortunately don't have photos of the (awesome) programs, menus, and place cards, but we did snag a shot of these custom die-cut hanging door tags that the bride and groom gave to their guests staying at the venue. 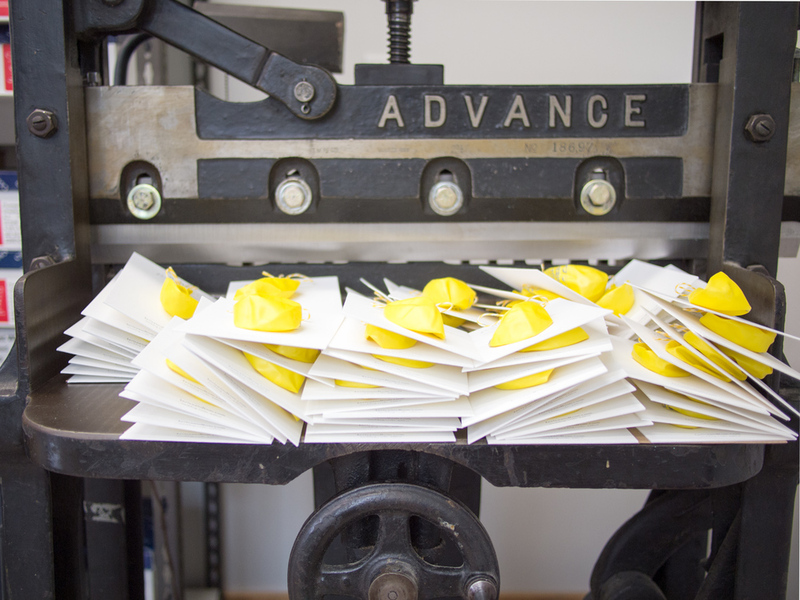 Posted in wedding invitations and tagged with fluorescent white, 600g, 300g, blind deboss, black, midnight, gold, foil, gold foil, save the date, square, espresso, envelope liner, pearl white, monogram, gate fold, door tag. May 19, 2015 by Travis Friedrich. Halloween's over, midterm elections are in the rear-view mirror, and we're barreling toward Thanksgiving (which, in our modern era, is a blink away from Christmas and New Year's). Then, the recovery from all that, followed by the dull expanse of winter. HOW DID IT GET TO BE FEBRUARY ALREADY, you ask? Well, take a breath; we're not there. Yet. 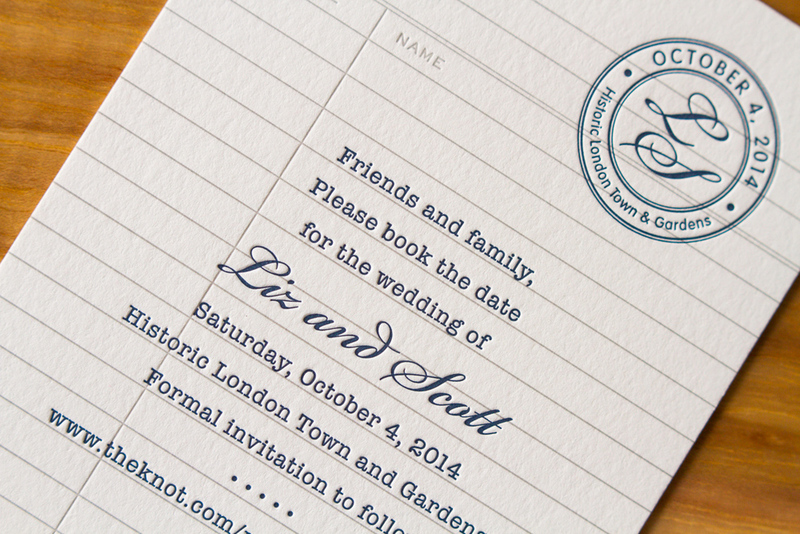 The “official” rule would be to send the save the dates 4 to 6 months before your wedding. But like with any other wedding guideline, it really depends on the situation. Some people order them a year ahead, others 3 months. But it tends to be more important to send them early if you have a lot of guests who’ll need to travel. 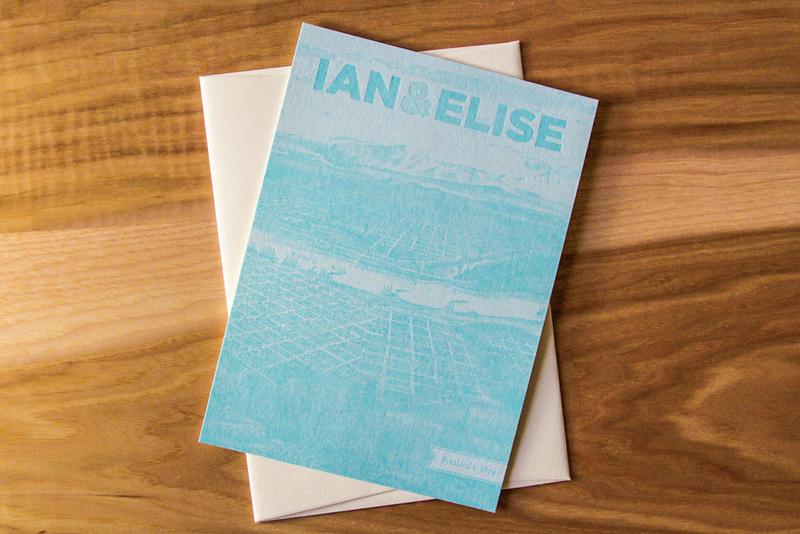 Customarily, save the dates are related to the invitations, design-wise. But they're usually much less formal, so people often opt to have a little fun with them. 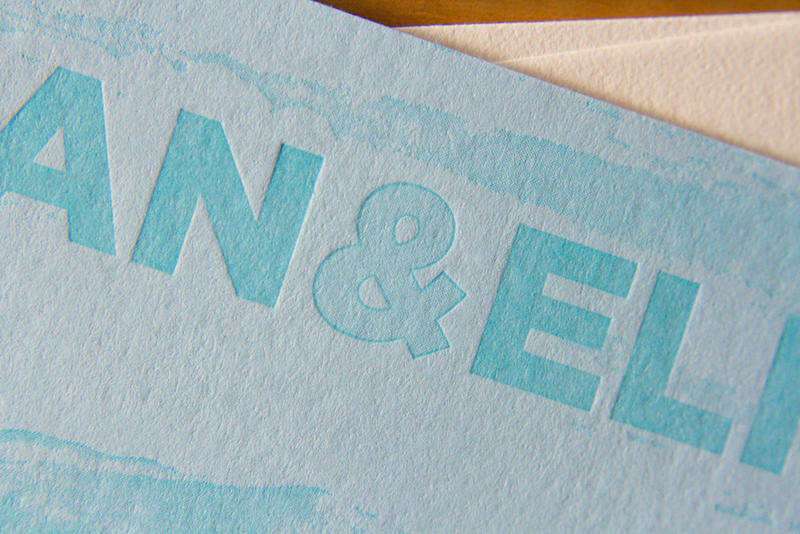 Parklife Press provides custom design work, included free (to a point) with a print order. Here's a card that was designed for a pair of librarians. It was done on pearl white stock with midnight and fog inks. 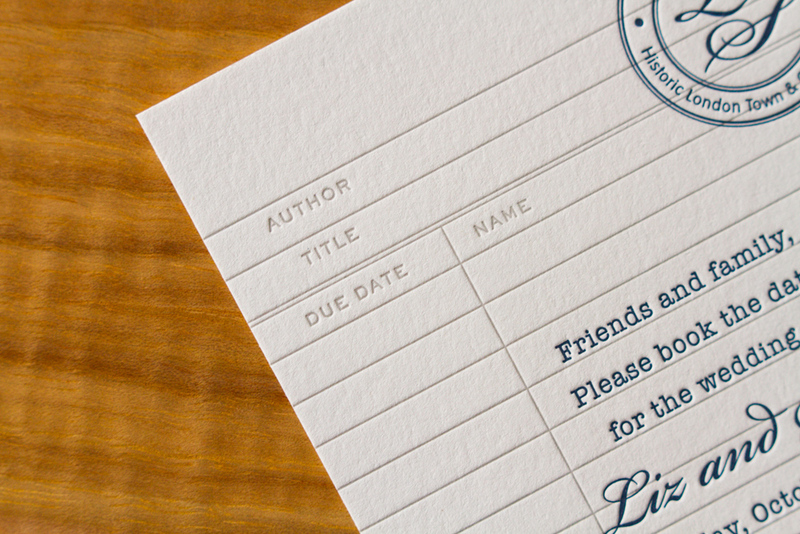 It resembles a library book check-out card, complete with an old-school typewriter font and custom monogram "stamp." There is a lot of leeway in what's included on card, but the most common elements are pretty straightforward. 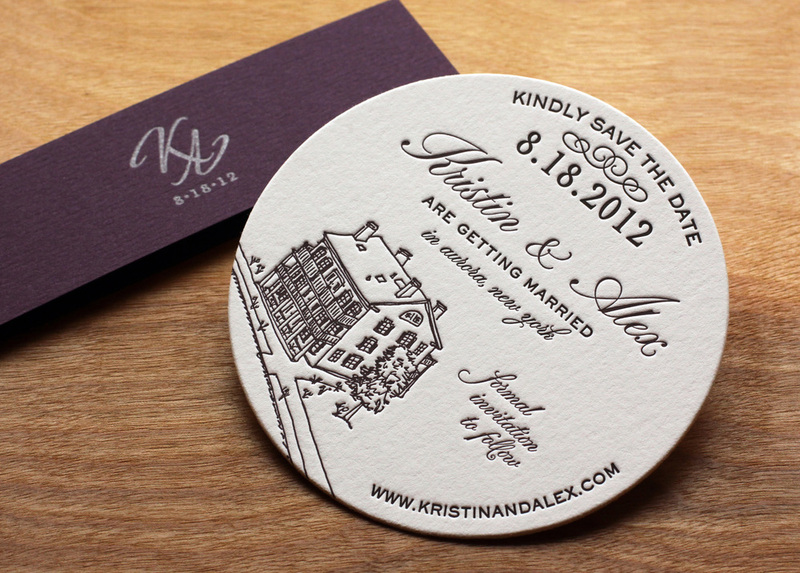 The couple's names, some version of the phrase "save the date" ("mark your calendars," "reserve the date," etc. ), and ... you guessed it: the date. 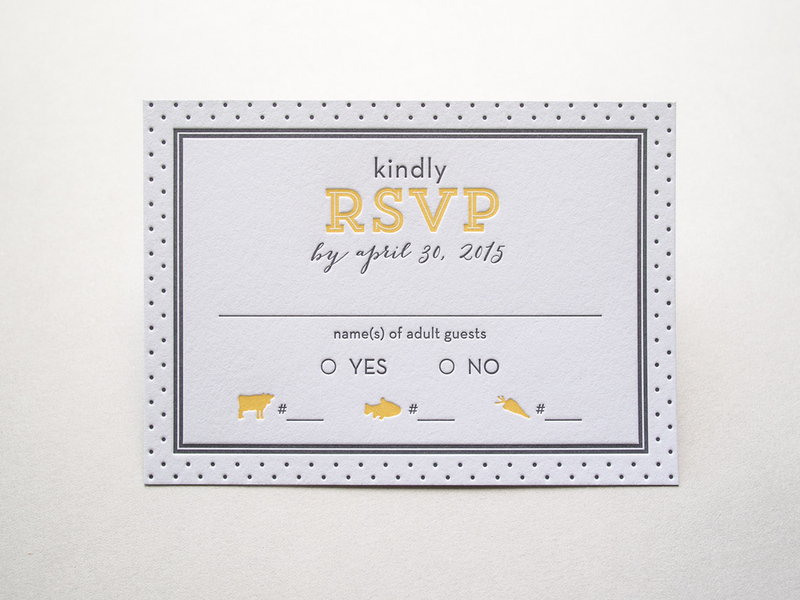 Then, add some version of the words, "formal invitation to follow." 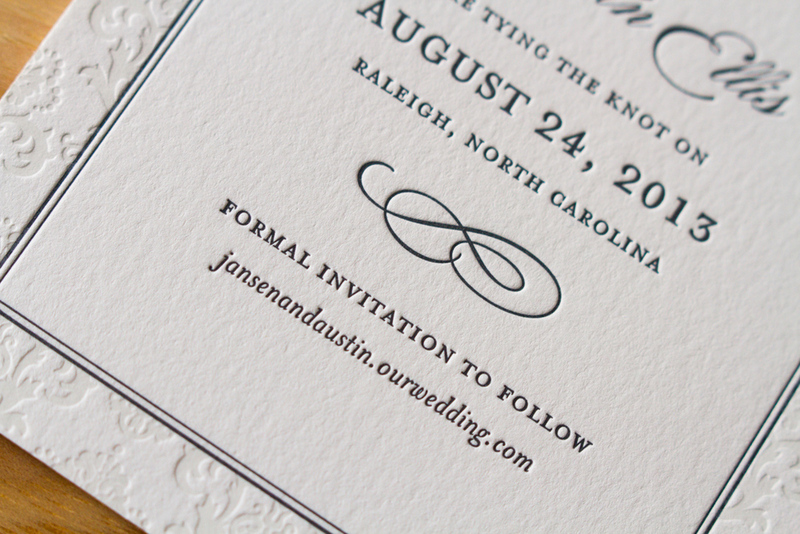 If you have a wedding website that has event details, including the URL is helpful. 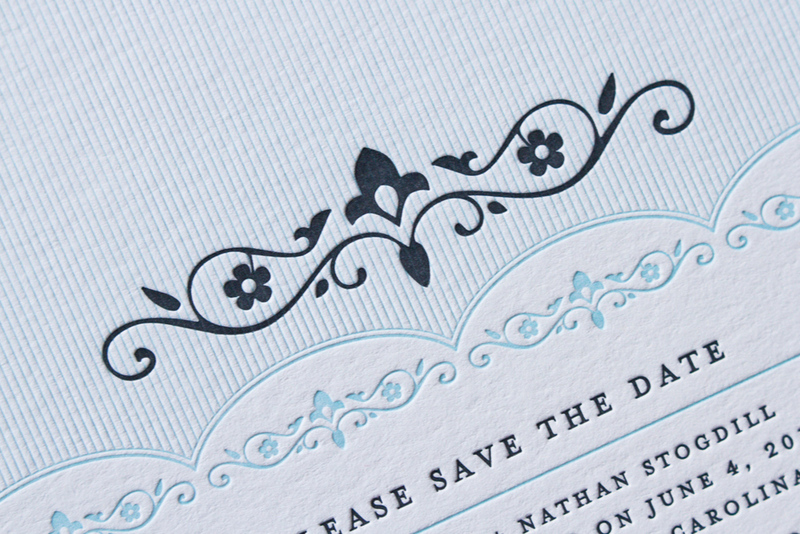 Some — like this one with a pale blue pinstripe and floral dingbat design — include the date, place, notice of invitation-to-come, but also include the accommodation information for those who like to make arrangements ASAP. 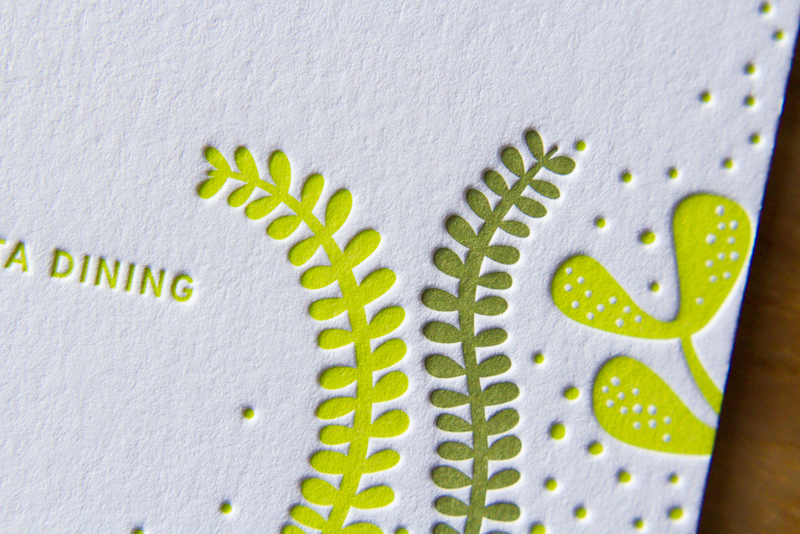 The card has lovely details — from the repeated floral vine to the scalloped pinstriped background to the repeated square dingbats — the set shows off the custom inks on the fluorescent white stock. It's based on Playbill design. 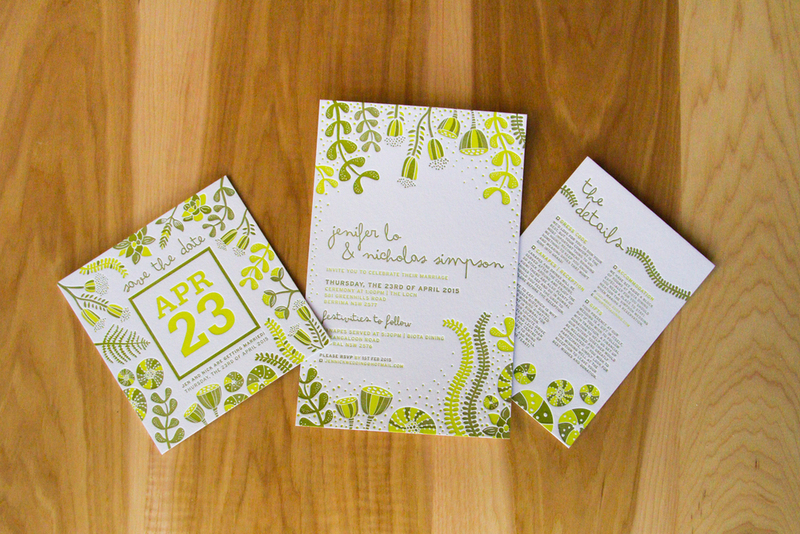 We can create a save the date based on any of our plentiful invitation designs. 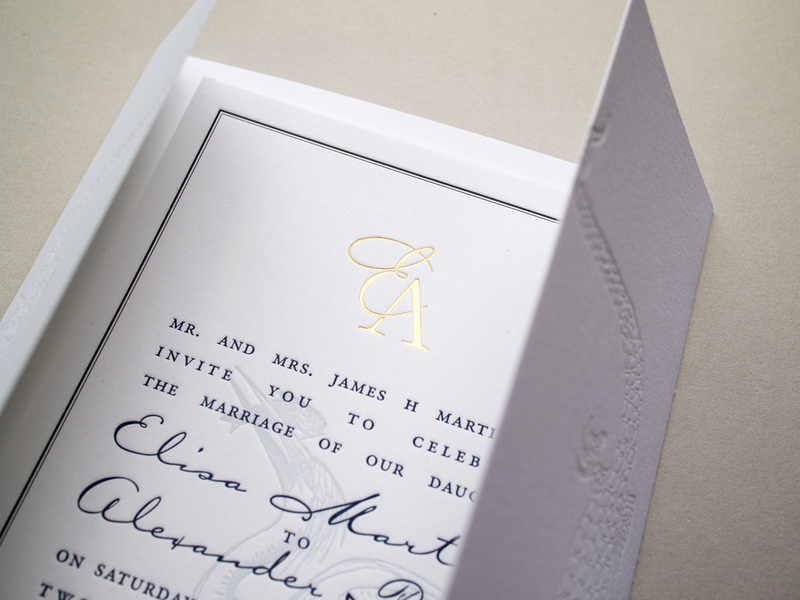 The card above, based on the Belvedere design, is more formal than some; it matches the invitation instead of just coordinating with the design elements. Note the large, swoopy dingbat, and and the custom border with floral motif impression offset by a double frame. 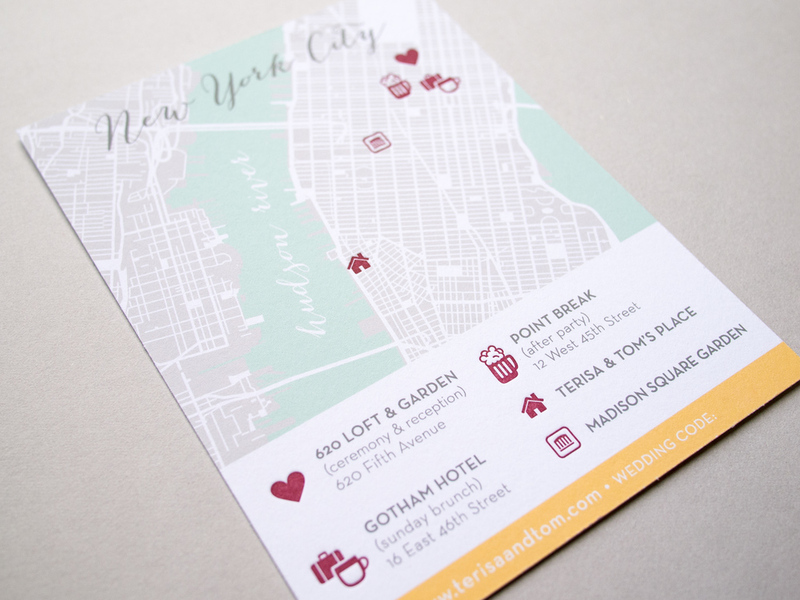 Location of the wedding is a frequent inspiration for save the date card motif. This is a playful one which focuses the well-known venue. The wedding will be held at historic Pinehurst Country Club in South Carolina. 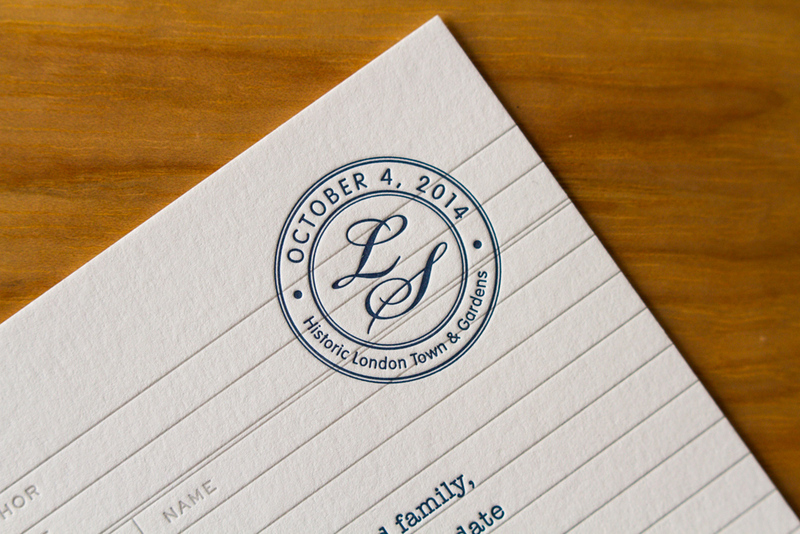 The card — printed in cheerful apple and sherbet inks on pearl white stock — features the club's logo and founding date. 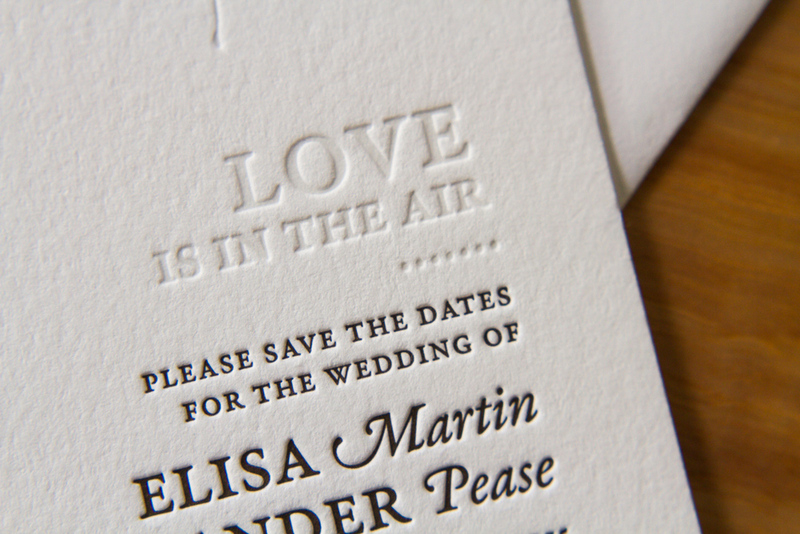 We're closing out this save-the-date round-up with a square card printed with espresso and white inks on pearl white stock. It's illustrated by breeze-blown dandelions and the words "Love is in the air." And as you look over the detail shots of the lovely illustration, keep in this in mind: Days, weeks and months can float away as easily (and quickly) as seedlings in the wind. 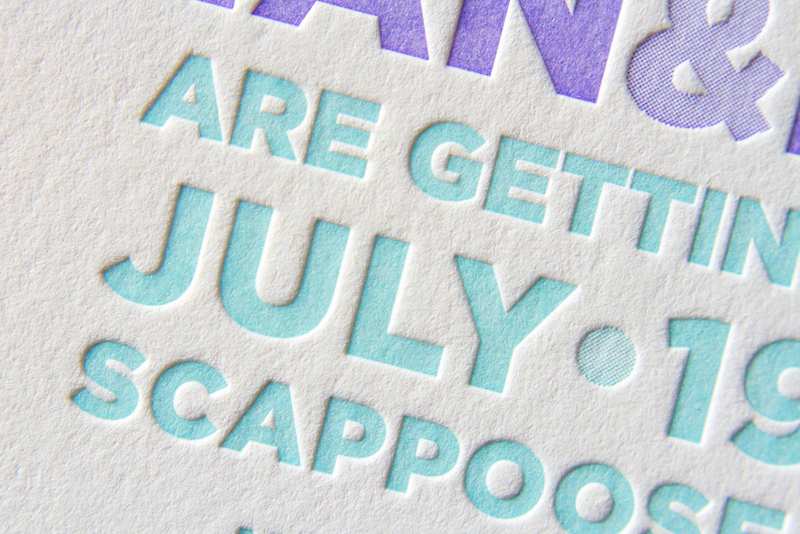 So, you know … get those save the date cards printed. 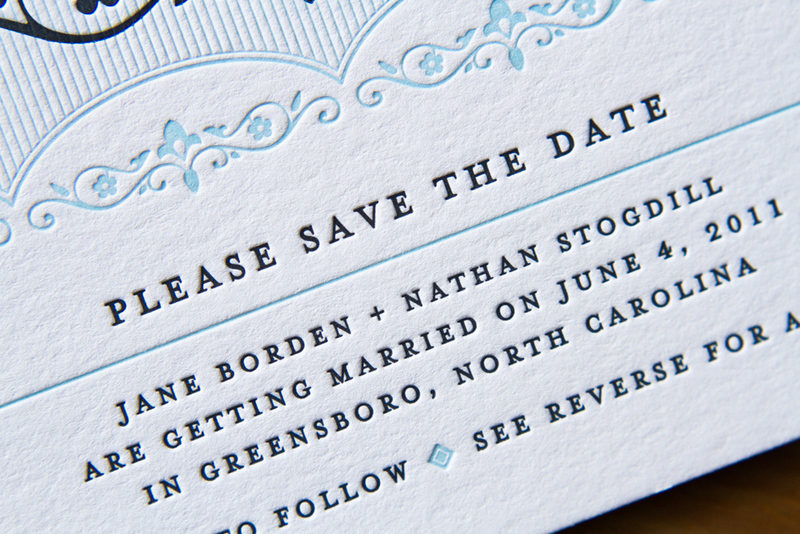 Posted in wedding invitations and tagged with save the date, general topic, sale. November 4, 2014 by Sarah Arneson.